It’s a parent’s worst nightmare: a young child is accidentally left in a locked car on a warm and sunny day. The closed windows turn the car into a greenhouse, and the child dies of heatstroke. In a key first step toward preventing such tragedies, three undergraduate engineering students at Johns Hopkins have turned technology from a popular video game player into a detector for children left behind in dangerously overheated vehicles. The young inventors tinkered with parts from a Kinect motion-sensing device, normally used with the Xbox 360 game console, and came up with the heart of a new system aimed at “seeing” children left in locked cars and summoning help. The project was developed during a two-semester mechanical engineering senior design course offered by the university’s Whiting School of Engineering. 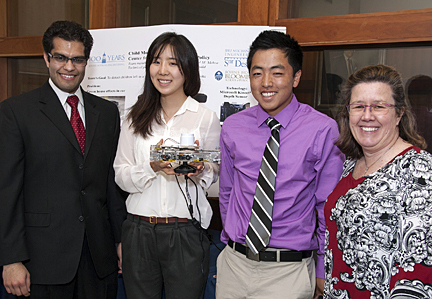 Teams of three or four undergraduates were each given a small budget to design and build a prototype requested by a sponsoring business or organization. This year’s results were unveiled recently at a showcase conducted shortly before the students were scheduled to graduate. McDonald asked Johns Hopkins mechanical engineering students Jeffrey Kamei, Yejin Kim and Anshul Mehra to come up with a better way to prevent these deaths. She also encouraged them to produce a passive protection system that would operate without requiring the driver to flip a switch or hook a wristband to the child to activate it. During brainstorming sessions last fall, the students hit on the idea of adapting the Kinect video game technology. The device uses an infrared camera and projector to sense the movements of a game player and incorporates these motions into what is happening on the video screen. The students thought the same technology could sense even the most subtle movements of a baby sleeping in a rear car-seat. An important advantage of using infrared technology, the students said, was that it cannot penetrate the vehicle’s glass windows, so it is unlikely that a movement outside the car, such as a pedestrian or a passing vehicle, could accidentally trigger the motion detector. But inside a car, early tests indicated the sensor should be able to quickly pick up a baby or toddler who is trapped or sleeping inside. Although the largest hurdle has been cleared, additional work must be done to complete and test the system before it can become a commercial product. First, researchers will either have to license Microsoft’s Kinect technology or develop other equipment that works in a similar way. Also on the drawing board are several options for the system to summon help when a trapped child is detected. These could include a loud alarm or an automated call to police or firefighters, or to a car security service such as OnStar. As they prepared for graduation, the student inventors said they had gained valuable real-world engineering experience while launching a project that could have significant public health value. “I’m glad we were able to build something that could protect babies,” added Kim, a citizen of South Korea who completed her high school studies in Texas. Notes: The 2012 NHTSA report on heatstroke and children in parked vehicles can be viewed at: http://www.nhtsa.gov/DOT/NHTSA/NVS/811632.pdf‎ . Updated statistics on heatstroke deaths of children in vehicles may be viewed on a website maintained by San Francisco State University researcher Jan Null: http://www.ggweather.com/heat/ .